FAQ - All American Towing Inc.
All American Towing of Louisville has put together a list of frequently asked questions by vehicle owners that have been towed and questions from property managers. We often get asked these questions during a tow by the person who’s vehicle is getting towed away from private property, which is a safety concern as our driver needs to focus on the equipment. If you’ve been directed here, our hopes are that your questions are answered. We can only provide you the answer with which the property manager or property owner gave us. It could be for any infraction or number of infractions against your vehicle being on the property. Please refer to your lease or rent agreement and consult with your landlord about your vehicle. Where is my car being taken to? 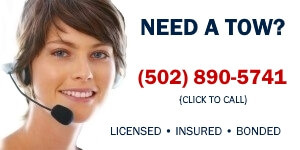 Your vehicle will be stored in our secure vehicle tow lot in Louisville. Your manager will give you the details or, if the tow operator is still in the area please ask and he or she will give you our card with the address. As well, there may be signs at every entrance with our company information on them. How much will it cost to get my car back? “How much is it going to cost” is not something that can be answered here as there may be additional fees. Along with daily storage fees, there may be additional tow fees due to the type of tow needed to remove your vehicle and the potential travel (mileage) fees involved. Why does towing cost so much? Towing someones vehicle is more expensive than you can imagine. Not only do we have the cost of fuel, vehicle maintenance and insurance; but we also have to have additional business insurance coverage. There is also our labor costs, federal taxes, employment taxes, property taxes, property maintenance, lease costs not to mention utility costs for the building and property we maintain. Towing is like any other business where there are costs involved in operation. All American Towing goes a bit farther by doing quite a bit of preventive maintenance on our local tow vehicles to ensure they are safe to operate and safe to tow your vehicle from point A to point B. When your vehicle is released to you at the tow lot, you may not want to bring it back to the property it was towed from as it can be towed again if the infractions haven’t been taken care of. You’ll want to talk with the property manager or owner about the status of your vehicle and what you need to do in order for it to be allowed back on the property. We know and understand that this may be harsh, and we’ve been there. Some of our tow operators and staff rent and also must abide by the rules of the property when it comes to their vehicle. There are rules in place for a reason. One of the more important reasons is to ensure the property doesn’t appear poorly maintained for the other residents. Having a vehicle that appears abandoned or in disrepair may be an eyesore to potential renters and neighbors. How much does it cost to tow a vehicle off my property? As a property manager, there is typically no cost for our services. A manager or owner of the property must fill out a contract with us and also advise us on why the vehicle is to be towed. This helps our tow operators when dealing with the person who’s vehicle is being towed as this can often be a stressful time. Again, our service is zero cost for the property manager or private owner of a property (grocery store, retail outlet, duplex, triplex, apartment complex or even an empty lot. Our tow operators are able to work with you or your security team 24 hours per day, 7 days per week. Where will the vehicle be taken to? The vehicle will be stored in our secure vehicle tow lot in Louisville.A person who asks can be directed to our location via our website or by calling the phone number on the warning Tow Signs on the property. How much will it cost for my resident to get their car out of impound? Each tow is different. There are exigent circumstances where it may take longer to remove a vehicle due to flat tires, wheel locks, re-positioning a vehicle and of course the time it takes to remove and placed in impound. As a property manager or private owner, we suggest you document the entire process of towing. From the initial cause of concern (broken window, flat tire, improperly parked, parked in a fire zone, etc), to the time the vehicle is towed away. Keeping accurate records will explain away any reason for having a vehicle removed from your property. What is wheel lift towing? Wheel lift towing is specified for certain types of vehicles and lightweight pick-up trucks. When a vehicle is in a tight area, such as an alley way, parking garage or when the vehicle has no tie down points for a flatbed, our wheel lift towing can remove the vehicle without a dent or scratch. Wrecker trucks are used in a situation where the vehicle has been totaled and cannot be driven away from an accident. Wreckers are uniquely designed with special equipment and tools to get the job done safely and without creating further damage. What are flatbed and rollback trucks? Flatbed and rollback trucks can be used for almost any type of vehicle. Flatbed trucks are most effective for vehicles that operate in four-wheel drive or specialty vehicles with modifications, such as a lowering kit or body work. Flatbed towing is also beneficial for vehicles that are transported long distance. Be sure to check with your car’s manufacturer to make sure flatbed towing is right for you. Do you offer recovery, winching and extraction services? All American Towing offers recovery, winching and extraction. These local towing services are used for vehicles that need to be pulled back onto the roadway and then loaded to a tow truck or flatbed to be hauled away. These operations are very precise in order to control the car for maximum recovery safety not only to the vehicle in question, but to surrounding property.